Automated tests that drive your application through its user interface (UI) are known as coded UI tests (CUITs). 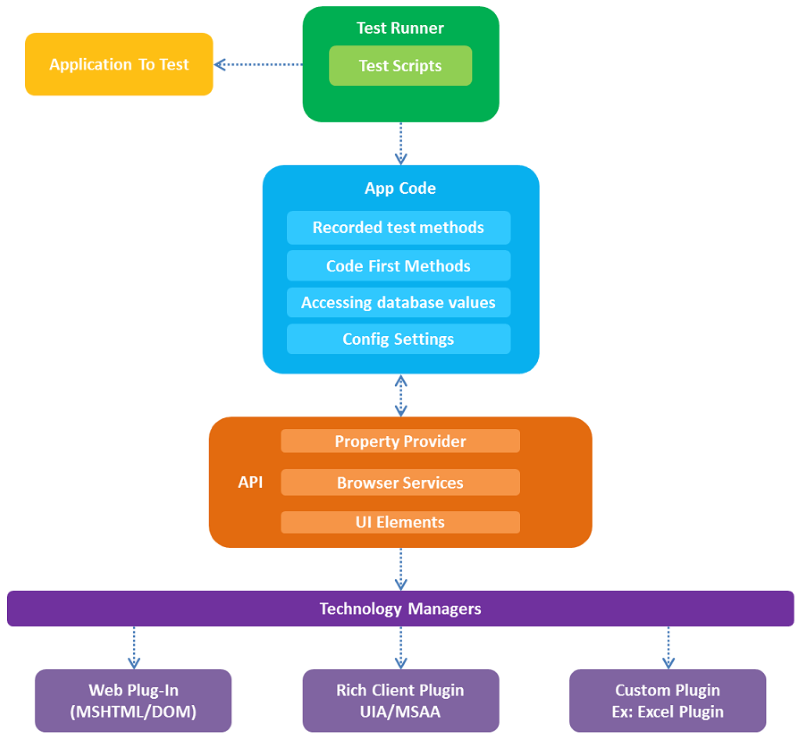 You can use Visual Studio Ultimate 2010 or higher or Visual Studio Premium to create automated tests of the user interface (UI) known as coded UI tests. These tests provide functional testing of the user interface and validation of user interface controls. Automated UI tests enable you to test that the user interface is functioning correctly after code changes. They are quicker to run than manual tests. Therefore, you can run them more frequently. Microsoft Visual Studio stores application related objects in its own UIMap repository. Software testers can move/copy all the Recorded/Asserted scenarios to either custom classes or to UIMap class. Testers can prepare scenarios based on captured objects or by using code first (descriptive) technique. CUIT Editor was initially made available in Visual Studio 2010 (feature Pack 2) onwards, which allows editing UI Map. Software testers can select any object to view its properties and can also change search properties or expressions. They can also expand the recorded actions and view the steps. Options are also available to delete the steps, split a bigger method into multiple methods. Software testers cannot add a new step to an existing action. File -> New -> Templates -> Visual C#/Visual Basic -> Test -> Coded UI Test Project. Assign a name to the project and save it in a desired location. Click on ‘Test’ menu and select ‘Generate Code for Coded UI Test’ and then click on ‘Use Coded UI Test Builder’. The recorded steps will be displayed by pressing Alt + S or by clicking on the icon available beside the record button. Assertion feature is available in Coded UI Test Builder. Normally, checkpoints are called as Assertions in Coded UI, an Assertion can be added based on the property of an element. In the ‘UI Control Map’, we can add, delete or rename controls. Once the assertion is added, we can set the comparison operator and the value to compare. We can add an Assertion (check point) by clicking ALT + U or by clicking on the Assertion icon available on the Coded UI Test Builder. Use the following guidelines to create a flexible coded UI test. Use the Coded UI Test Builder whenever possible. Do not modify the UIMap.designer.cs file directly. If you do this, the changes to the file will be overwritten. Create your test as a sequence of recorded methods. For more information about how to record a method, see Creating Coded UI Tests. Each recorded method should act on a single page, form, or dialog box. Create a new test method for each new page, form, or dialog box. When you create a method, use a meaningful method name instead of the default name. A meaningful name helps identify the purpose of the method. Create each assertion using the Coded UI Test Builder, which automatically adds an assertion method to the UIMap.Designer.cs file. If the user interface (UI) changes, re-record the test methods, or the assertion methods, or re-record the affected sections of an existing test method. Create a separate T:Microsoft.VisualStudio.TestTools.UITest.Common.UIMap.UIMap file for each module in your application under test. For more information, see Testing a Large Application with Multiple UI Maps. In the application under test, use meaningful names when you create the UI controls. This gives more meaning and usability to the automatically generated control names. If you are creating assertions by coding with the API, create a method for each assertion in the part of theT:Microsoft.VisualStudio.TestTools.UITest.Common.UIMap.UIMap class that is in the UIMap.cs file. Call this method from your test method to execute the assertion. If you are directly coding with the API, use the properties and methods in the classes generated in the UIMap.Designer.cs file in your code as much as you can. These classes will make your work easier, more reliable, and will help you be more productive. Permalink Submitted by jonathan on January 29, 2012 - 20:48. Another advantage it may be integrated with SpecFlow or another BDD/ATDD tool for tessing. Permalink Submitted by jonathan on March 19, 2012 - 07:45. Permalink Submitted by jonathan on March 19, 2012 - 08:25.